We aren’t prepared for cyber risks. This has been demonstrated time and again by some of the largest multinational corporations and federal governments worldwide. But with the average cost of a data breach expected to average US$150 million next year, organisations must reprioritise their budgets to combat these threats. The market for cybersecurity solutions is set to experience serious growth as cyber risks and threats continue to evolve. Experts say US$6 trillion will be spent globally on cybersecurity by 2021 as businesses of all sizes, as well as government organisations, better appreciate the real risks they face, whether they be financial, reputational, or threats to national security. This will no doubt benefit providers of cyber security solutions. However, there’s much more to the WhiteHawk Ltd (ASX:WHK) story. Led by former deputy director of US Naval Intelligence, Terry Roberts, WHK is assembling an impressive list of clients and partnerships. The Alexandria, Virginia, USA based company has developed the first online self-service, cybersecurity exchange, simplifying how companies and organisations implement cybersecurity solutions. These solutions directly mitigate a business’ key cyber risks and assist US companies to connect to content, solutions, and service providers. And the company has immediate potential share price catalysts in the works, which could deliver some sharp gains for shareholders. That’s “three additional sales of the 360 Cyber Risk Framework and one Strategic Partnership with a Bank or Insurance Company”. 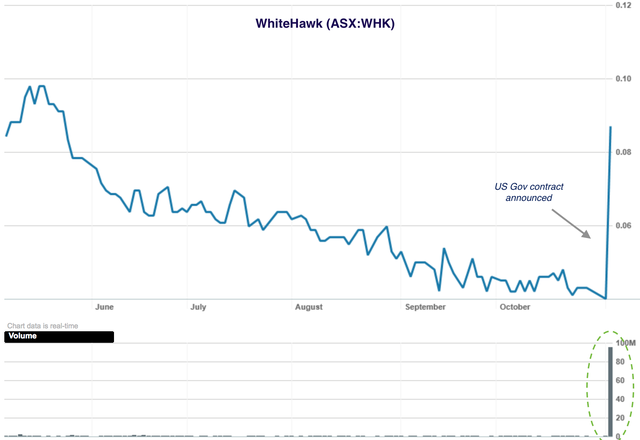 Back in November, WhiteHawk inked a deal with a “key US government department”, which sent the company’s share price up as much as 188% immediately after the announcement, on significant volume. The stock rose from $0.04 to hit a high of $0.115, before closing at $0.87 to finish the day with a 118% gain. The initial phase of the contract was minimal (~US$100,000), yet it will be followed by customer evaluation and an option for expansion. And while only a relatively small initial contract, it was the catalyst needed to reinvigorate investors following months of speculation around the pipeline government contracts. The deal involved WHK providing a tailored version of its 360 Cyber Risk Framework to US government departments to protect against supply chain intrusions. It will see the company provide sensitive risk analytics and mitigation, along with added required protections across office and mission functions. Phase 2 would expand the scope of the risk framework across the US Government department to monitor and service all vendors, where WHK can derive additional revenues from the sale of vendor's products purchased across the Exchange. No doubt this further upside excited investors too. The contract came after reports of the US Government upping its focus on the systemic risks posed by IT and software supply chain vendors, specifically at Department of Defense and Department of Homeland Security, and is taking proactive action to protect itself from cyber threats. Further contract news came in December when WHK signed a Cyber Risk Framework contract with an unnamed top 12 US Defense industrial base company (with US$5 billion in revenue), plus a contract extension with unnamed US top 10 financial institution. These were also well received by shareholders who almost doubled the share price in the days after the release. Other contract wins to date include a real time partnership with Clarke & Sampson Insurance — a top US Independent Insurance Agency that specialises in cyber liability insurance; a key US government department contract to protect against supply chain intrusions; and a contract with a US utility sector customer that manages a power grid that serves over 20% of all US electricity customers (Again, details remain in confidence). But when it comes to the expected contract signing mentioned in the company’s final 2018 report, we’re still waiting. So why am I so confident? Even though we’re now in the second week of April, I have every reason to believe that these deals remain in the pipeline and will be announced in due course. While I generally like to see management teams stick to their timelines, it has to be acknowledged that it’s not always a factor that’s under their control — especially in a case like this where we are dealing with sensitive information combined with onerous legal and bureaucratic processes. It’s not worth getting caught up in the specific timing if it means missing out on the potential upside. I see it often with mining exploration companies and delayed drilling results. Delays are nothing to be concerned with, usually due to outside factors, bad weather, or external contractors not holding up their side of the deal. So while the first quarter has come and gone with no sign of these additional sales contracts, nor a strategic partnership, that doesn’t mean that loyal shareholders will be left waiting forever. I have word direct from WHK founder and CEO Terry Roberts that they are on the way, although I couldn’t nail down when they would arrive or the specifics. The company continues to hold the line that they are confident on the next major contract, as well as other contracts, but can’t control final timing which is in the hands of the counterparties. These could come from the US Government, a very large corporate in the US financial sector, or from the US Defense or utilities sectors. While we don’t know the specific details of these “upcoming contracts”, what’s important is that there’s no reason to believe that these contracts have fallen through or have been passed on. We know that prior contract announcements have been reflected in share price rallies. These too could likely act as a share price catalyst; as we’ve seen with prior WHK contracts that have had an immediate impact. Also, it’s not just the contract announcements themselves that have the potential to be reflected in a higher share price, it really comes down to the contract details and any potential recurring revenue that will add to WHK’s bottom line, potentially over multiple years to come. With WhiteHawk, It could simply be a matter getting in early and staying patient.